Over the last month I’ve been developing and testing a recipe for frozen margaritas. I just published my findings at Examiner.com. Cocktails are what the Examiner readers want, especially today—Happy National Tequila Day! But for you, my fellow tequila-sippers and adventurous explorers of agave spirits, I thought you might like to know a few other things I learned in my month-long quest for a versatile frozen margarita recipe. 1) There is actually science behind our love of sweetened citrus juice. Lemonade (and anything with a similar combination of citrus juice and sugar) has stress-reducing and relaxing properties from both the citrus juice and glucose. Add the power of tequila to this, and it’s no wonder the margarita (frozen or otherwise) is the perfect antidote to the stress of modern American life. 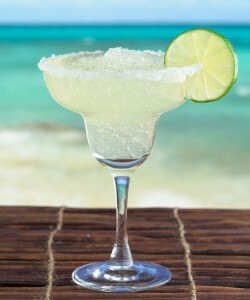 3) Don’t be afraid to put a favorite sipper into a margarita. I did my experiments (for the sake of cost and because I find it to be a decent base tequila for a house full of margarita-craving guests) using Kirkland Silver Tequila, which I bought for about $20 at Costco. But I also experimented with a few of my favorite sippers and some different ages. Just as these finely crafted tequilas offer you complex and unique flavors when you sip, these same characteristics shine through brilliantly in the frozen margaritas. Your tequila-loving friends will appreciate sharing this discovery (it is also a fun game to see if they can guess what tequila you used). One of my favorites was using Casa Noble Reposado in a frozen mango margarita—it was definitely a divine moment. 4) Sparkling lemonade/limeade adds pizzazz. I was hesitant to include this ingredient in the final recipe, but it was such a big hit, even though you don’t have to add very much. My theory is that the bubbles give it a lighter, more exciting texture that people find even more refreshing. I also think the carbonation may assist in a faster delivery of the effects of alcohol and sugar in the body and mind. I preferred to use sparkling lemonade and used the Trader Joe’s brand. I did not attempt any other similar or more widely available sparklers, but I suppose if you have rarely-used workout equipment or old appliances littering your front lawn, Sprite or its generic equivalent will probably be an acceptable substitution for you and your guests. 5) Feedback is not only welcome, but encouraged. My research and published findings are admittedly nonscientific and are in part biased, intended to spread the gospel and espouse the benefits of 100% agave tequila—even in a frozen margarita. I’m very curious for feedback from friends, brand reps, aficionados, mixologists, and the general public. Did you like it; did you hate it; can you offer suggested improvements; was there a fruit (or combination of fruits) that you really enjoy; etc.? If so, help us all on a journey of discovery by leaving a comment here or in the original article.